The Bad News: Bacon Bacon's truck was totalled in what had to be the most delicious smelling car fire ever. 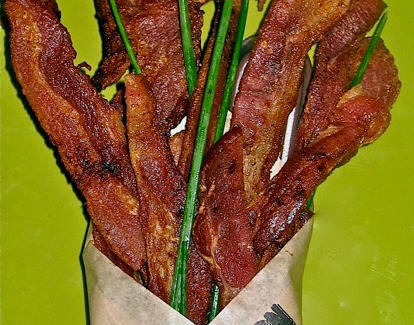 The Good News: they're now concentrating more on their brick 'n mortar to bring you six new specialty bacon bouquets like The Spicy Momma (cayenne, brown sugar), The Chicken Fried (self explanatory), and of course The Original, which includes bacon, bacon, and also bacon. Plus some bacon. And also: bacon.